Any business owner can manage their own advertising signage on the first day.​ If you have questions about how our systems work see the Frequently Asked Questions below. If you cant find the answer call us now at 239.254.9206. Q: What do you mean when you say “content display”? A: In the digital signage world, a content display refers to the TV or monitor that you will be using to broadcast your information to. For example, a looping PowerPoint presentation, message board, video, menu, pictures, spreadsheet etc. This is called your “Content Display”. Q: My TV/monitor are LESS than 10ft away from the system. Do I need the video extension options? A: No. If your content TV or monitor is within 10ft of the system, you will connect directly to the video card and would not need the extension options. We will include 10ft video extension cables (VGA, DVI or DisplayPort) at no charge with the system. Just let us know what type of ports you have on your TV or monitor so we can give you the correct cables. You may let us know this in the comments box during checkout. Also, if you are less than 10ft away you may use ALL of the video ports on the video card for content displays forgoing the control monitor. You would need a control monitor if more than 10ft away because you would not be able to see what is on the screens any farther away than that. Q: What is a “control monitor”? A: A control monitor is a regular monitor, included with the system and connected on video port #1. It is used to manage the content displays at a remote distance. You would need a control monitor if more than 10ft away because you would not be able to see what is on the screens any farther away than that. For example, let’s say your content TV is 100ft away from the system. You will need a way to view what is being shown on that TV 100ft away. That is where the control monitor and Video Extension Modules come in (see below). Q: If my content display is at a distance, how will I see what is on the screen? A: We include a software utility with the system which allows you to “pull” the content back to the control monitor (in the back office let’s say), make your changes then “push” it back out to the distant display. Q: How is the video extended out to the remote content display? A: Using our CAT6 Video Extension Modules (VEM), more details above. These are available as options during checkout if needed. Q: What type of video can I extend with this model? A: VGA (up to 300′), DVI (up to 160′) or HDMI (up to 300′). Q: Can I extend audio as well as video? 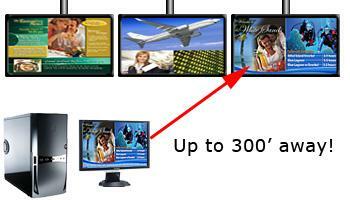 A: Yes, just add our HDMI version of the video extenders to your order during checkout (160ft or 300ft options). If you are NOT extending you can also transmit audio and video over DiplayPort cables under 10 ft.
Q: Are the VEM’s difficult to install? A: No. Just run 1 or 2 (depending on connection and distance) CAT6 network cable(s) from the DS-Z system out to each of your remote content displays. Connect a transmitter VEM on the system side, and a receiver VEM on the content display end. You will need your own CAT6 cable(s) which can be purchased at any Home Depot or similar store. Q: Can I use CAT5e instead of CAT6? A: To get the maximum distance out of the VEM’s, CAT6 is required. It is possible to use CAT5e however it will shorten the distance of video extension up to 50% on 1080p. Using CAT6 is highly recommended. Q: I plan on extending video using your VEM option. Are the short video cables included to connect my TV/monitors to the VEM’s? A: No, but these short cables (usually about 6ft) come standard with your TV’s or monitors. If not they are available at any Best Buy type store. Q: I do NOT plan on extending video I will connect my TV/monitors directly to the video cards. Will you provide these cables? A: Yes. If you are NOT extending you will connect your content displays directly to the video cards. We will include either VGA, DVI or DisplayPort cables with the system. These cables are about 10ft long and you will get one cable for each port. For example if you have a 7 display system, we will provide 7 x 10ft video cables. Again this is only if you do NOT require video extension beyond 10ft, and you are not using video extenders. Q: Can I use this system for a message board? A: Yes. This system makes a very effective and versatile message board. Schools, universities, libraries, transportation etc are all examples of who use our systems. Q: Can I use this system for advertising or have a scrolling slide show?